The Siamese twins (NGC 4567 and NGC 4568. 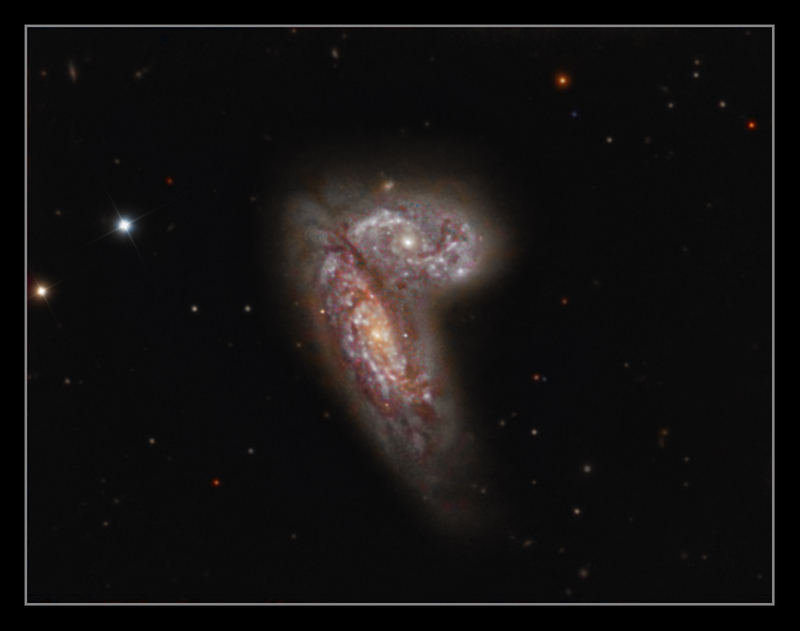 Also known as the Butterfly galaxies for obvious reasons) were discovered by the man who seemed to discover almost everything, William Herschel, in 1784. They are part of the Virgo cluster of galaxies, and based on their redshifts, are 120 million light years away. The image was taken with my new Edge 11 SCT at F10 (2800mm FL), and is exactly the sort of target I wanted a large aperture long focal length scope for, as I find interacting galaxies fascinating, but many of them are very small. The camera was an Atik 16HR, and all subs, including the luminance were binned 2x2. It's not normal practice to bin luminance subs, but at F10 the scope is very slow, and at that focal length the resolution is limited by the seeing, and so there was no loss of quality with the subs binned, but a considerable increase in sensitivity which made up for the slow F-ratio. I managed to get a couple of nights of luminance data, but it looked like I wouldn't be able to get any colour before I went away for work, but right at the eleventh hour I got a clear night, and managed to grab enough data to add colour, although the image really needs lots more data in general, and I've had to pull a few tricks out of the hat to reduce noise generally throughout the processing. Luminance was 23 x 6 minutes, Red and green-14 x 4 minutes each, and blue was 21 x 5 minutes. Total imaging time-5 hrs 55 minutes. Imaged on the 23rd April and 3rd May 2011. Another thing I tried with this image was shooting some RGB subs of a relatively clear area near the target specifically to image the light pollution, which I then could use as a kind of LP flat frame, and subtract from the image. In the past I've simply equalised the background levels, but I found that doing it using the new method meant that I had a lot less work to do colour-wise during processing. I haven't perfected this yet and need to experiment a bit more but the method seems quite effective, and on a target that has enough clear sky surrounding it, a LP sample could be taken directly from the image and then resampled to match the correct image dimensions before being applied.